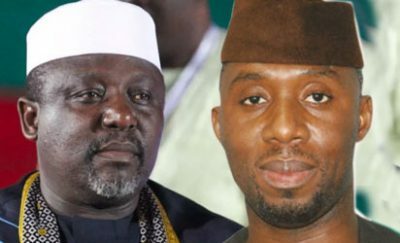 Governor Rochas Okorocha of Imo State has said that he was yet to forgive his son-in-law, Mr. Uche Nwosu for wooing his daughter without his knowledge. Okorocha also said his administration has completed more than one thousand projects in the state. Speaking with State House correspondents in Owerri, the governor stated that he was not in the habit of commissioning projects, adding that he considered it a distraction. His words: “What qualifies Uche Nwosu to take over from me is because of his vision and not a relationship. When he joined me his hairs were dark but now they are grey. He is hard working, he has the passion. I met him in 1999 when he was a student union activist. “It was his passion and hard work that brought him close to me. He became an asset to me at Rochas Foundation. “Nobody can accuse him of any wrongdoing. His only offence is that he is my in-law. “We don’t owe salaries, where we have challenges is in the high pension payment of N1.47 billion monthly when I came on board.